Panorama shot taken from the top of Inspiration point. This spot was a 4 mile hike into the monument. Definitely, an inspiration! Click on photo to see larger version. 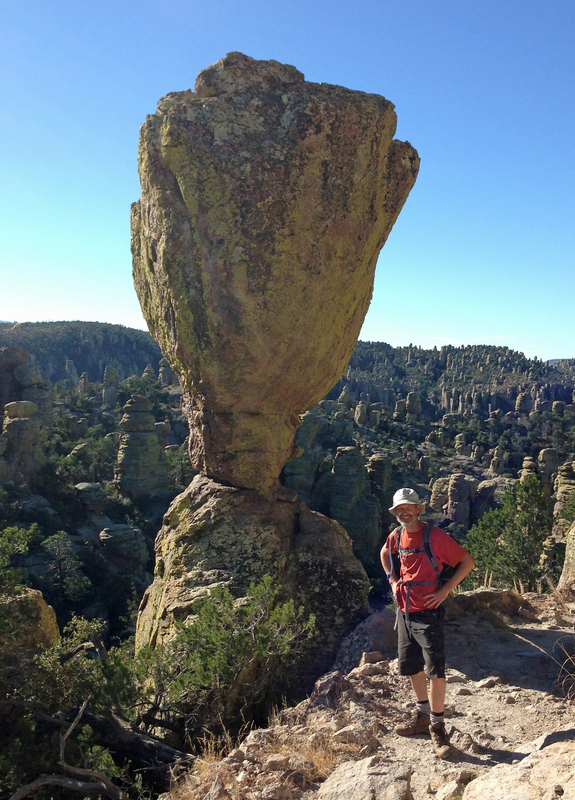 We pulled out of Silver City, NM on November 7th and headed straight for Chiricahua National Monument just past the NM/AZ border. Another of those amazing desert mountain ranges that seemingly pops right up out of the middle of the desolate desert southwest. 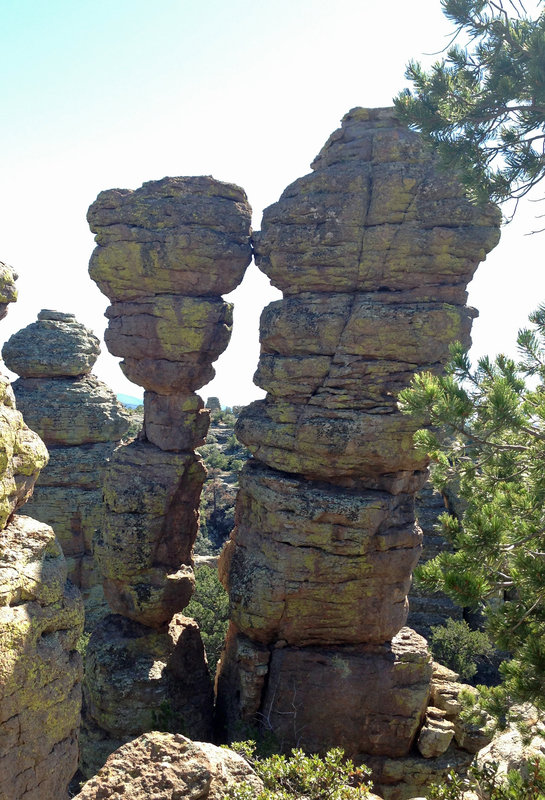 In the Heart of the Rocks trail, so many huge, gorgeous rock formations! 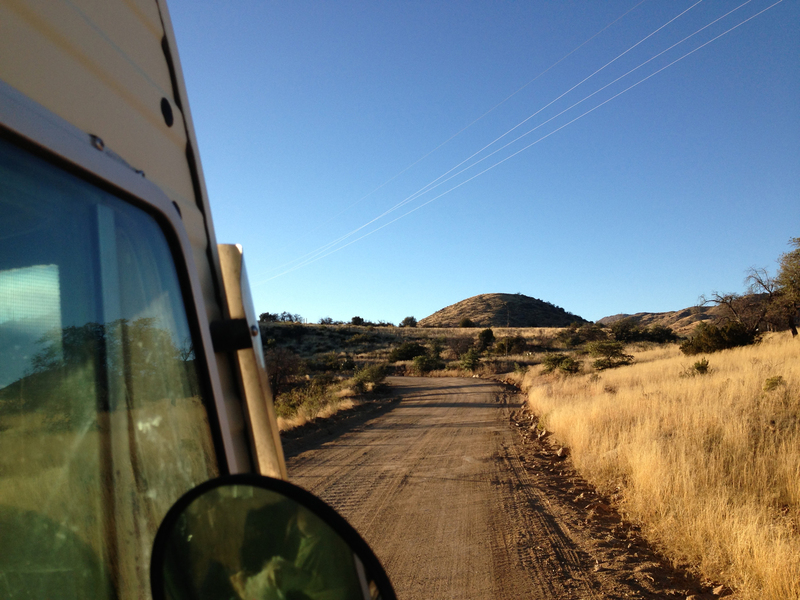 Using my iphone maps as a guide, we ended up driving our RV down a scary dirt road. We have since bought an atlas in book form. No more trusting the iphone map app! It’s not necessarily that the dirt road was so bad, but we happened down said road at the least opportune time of day. The sun was in that spot where it shines right into your eyes as you drive towards the horizon. The road was a bit twisty and of course we had never been on it before so we had no idea what to expect. Luckily, the dirt road only lasted 11 miles, but it was the most nerve wracking 11 miles! It seemed to go on forever! Of course it didn’t and we eventually ended up in a beautiful mountain canyon campground. 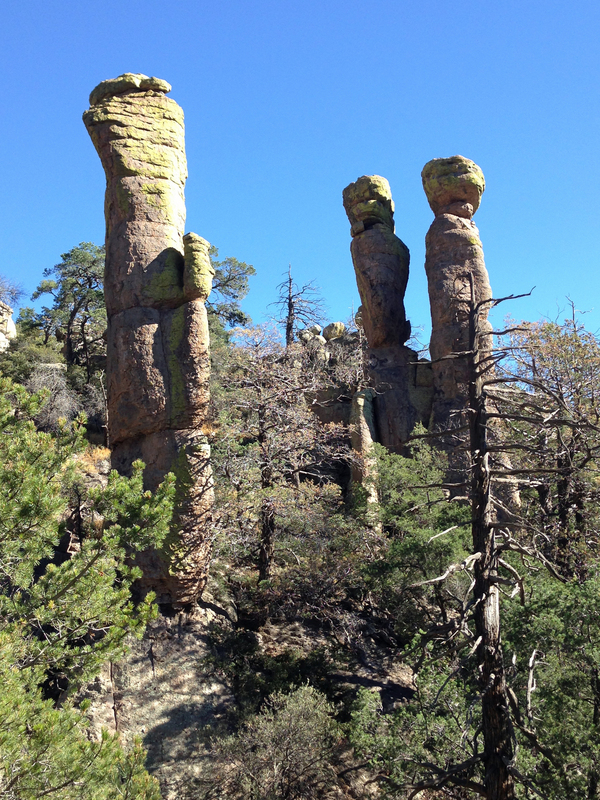 The Chiricahuas are known for their awe inspiring rock formations. They resemble crowds of people, sentinels watching over the canyons like ancestors of the Apache natives that once called this place home. 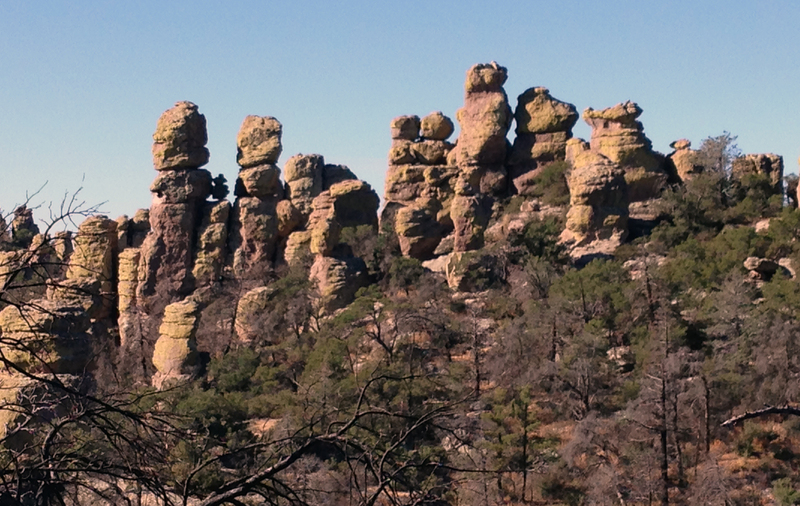 These mountains were the last stronghold of the Chiricahua Apache tribe. Geronimo was a member of this tribe and he fought hard to hold his homelands as long as he could. Though the story of the last Apache war is a sad one with the tribe eventually being put on a reservation like all the other Native Americans of this land. 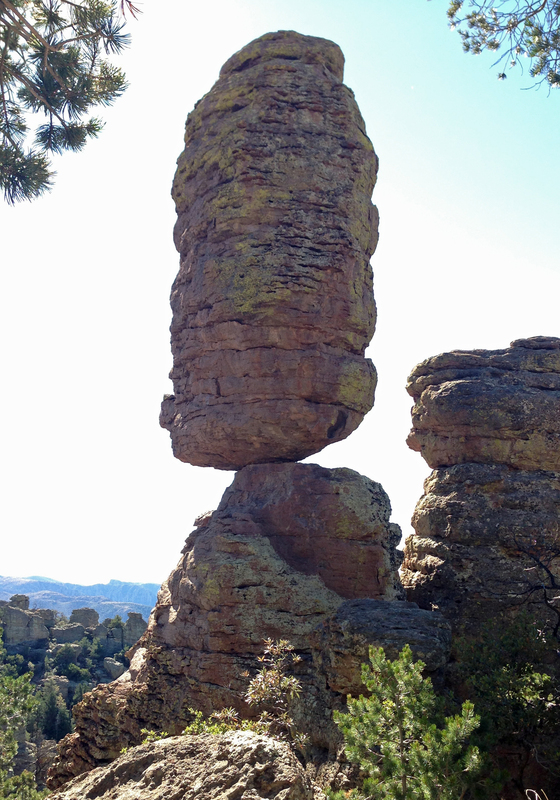 There were numerous balanced rocks like this one all over the place. Luckily for us all, the homesteaders that took their place loved the place so much that they saw to it that it was preserved for future generations. 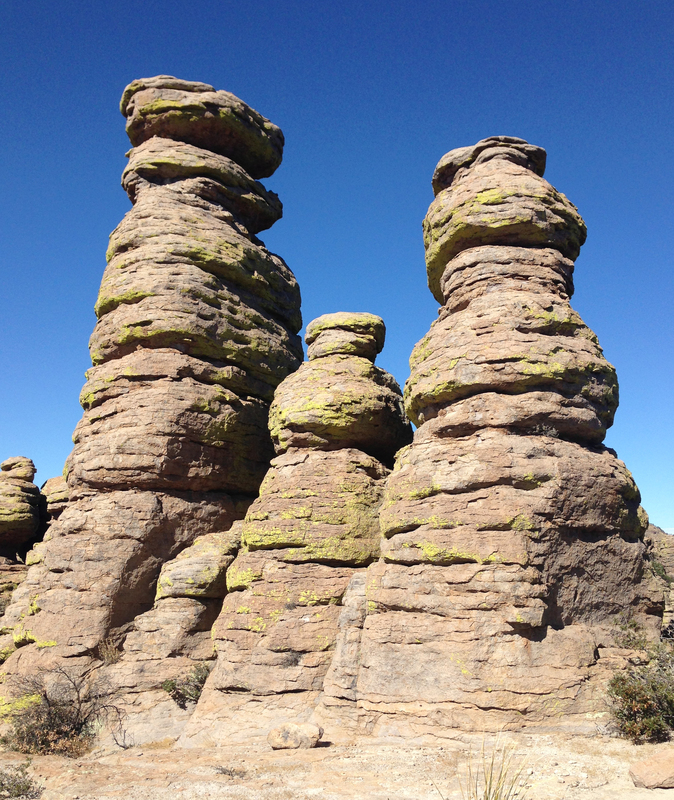 They were instrumental in seeing the Chiricahua National Monument and National Forest designated for the benefit of us now. 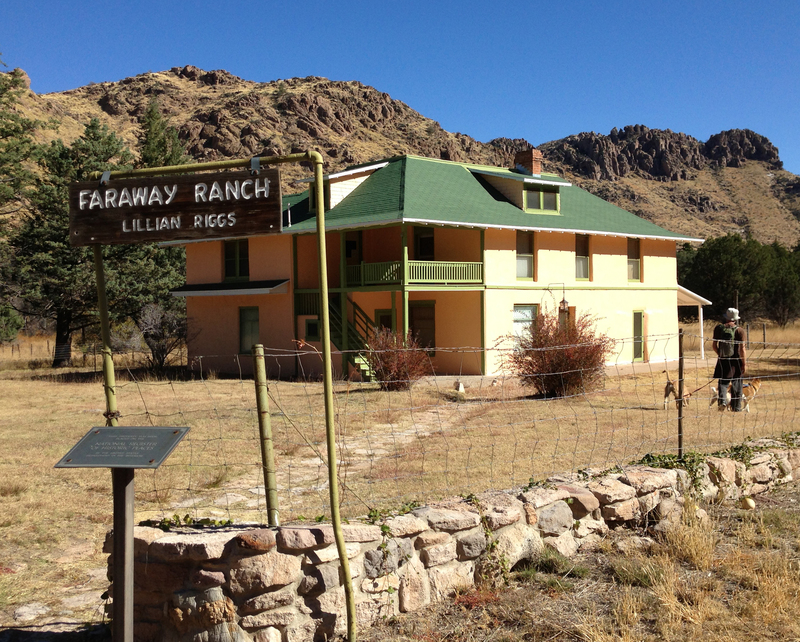 Faraway ranch is where the homesteaders settled and built their ranch in the late 1800s. 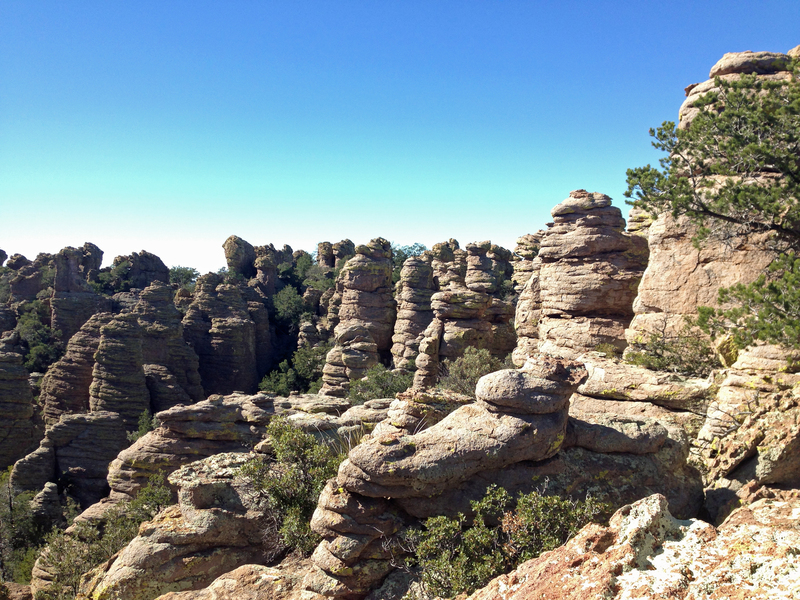 The Riggs ended up being instrumental in getting Chiricahua designated as a National monument. 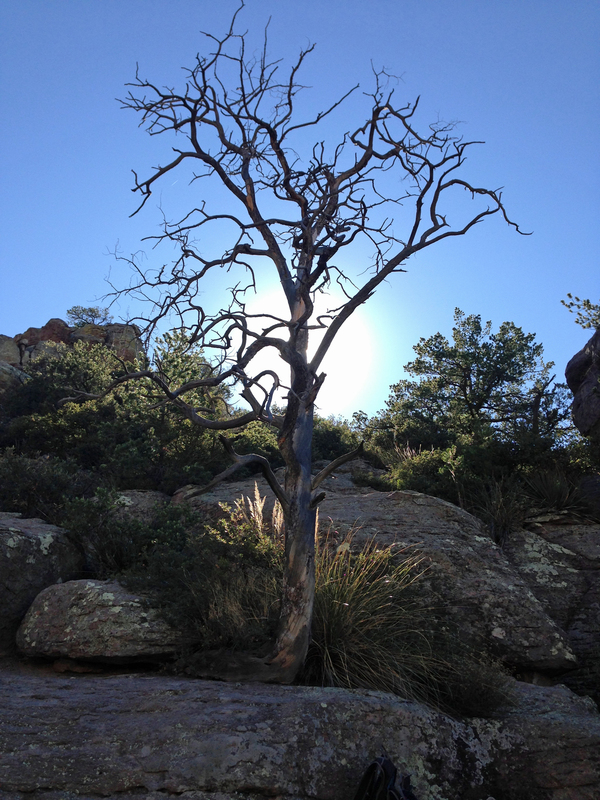 The landscape is reminiscent of the area around Silver City, the Gila Wilderness and National Forest. Deep canyons surrounded by tall rock formations and trees. Sadly, in 2011, this area was devastated by a man made forest fire. Much of the trees are now only charred skeletons, though there are still places where the fire didn’t reach and the shade of the tall trees is a relief from the heat of the sun. The weather here is absolutely gorgeous this time of year. The temperatures ranged from the upper 30s lower 40s to the mid 70s while we were there. We spend two days hiking, a 6 mile hike the first day and a 10 mile hike the second day. We encountered a rattle snake on our second day, though we didn’t see him, we heard his warning rattle clearly coming from a pile of rocks on the side of the trail. 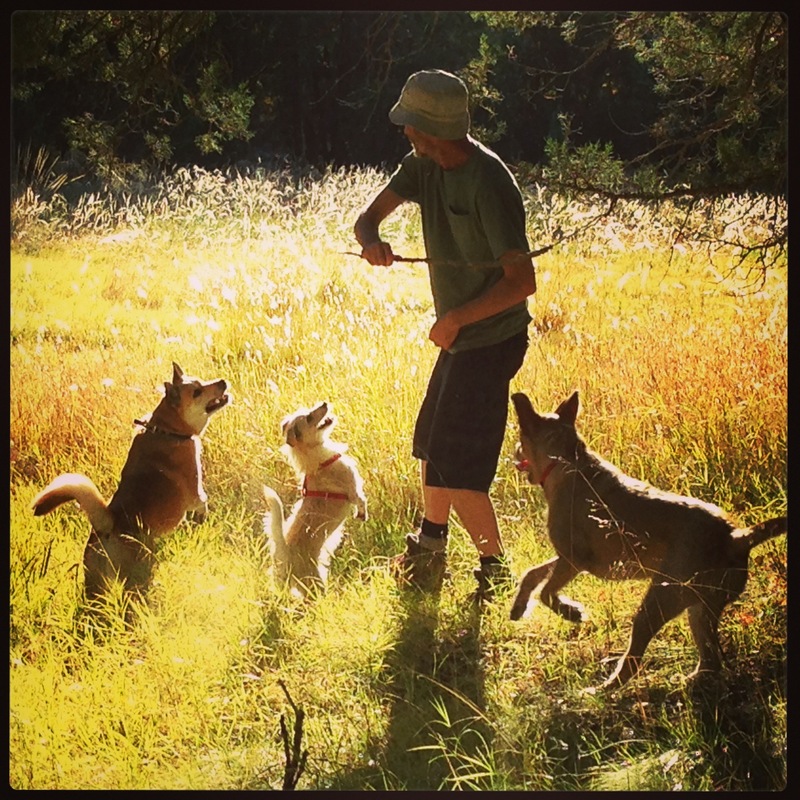 Unfortunately, for our doggies, there was only one meadow trail leading to the old homestead where dogs were allowed. So we added on another 6 miles of walks with the dogs to make up for the fact that they had to spend hours at a time in the RV while we were out hiking. I took 280 photographs during our stay! Everywhere I looked was another rock formation or beautiful vista, textures galore and birds, birds, birds. The hardest part about putting this blog post together was picking just a few photos from the pack. There were no hookups at the campground, so we had to leave after only 3 days because our ice had all melted and honestly, after 22 miles of hiking, we were ready for a shower and a cold beer! I call this one Ancestors. 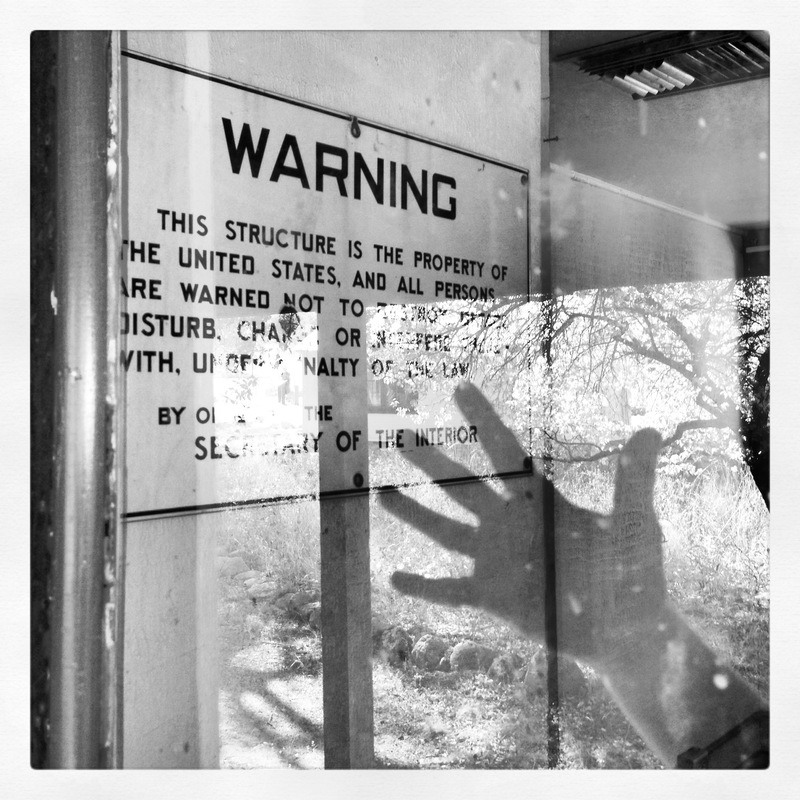 The entire time we were hiking through the monument it felt as if we were being watched by the Apache ancestors who once inhabited the area. We are now parked in the Queen Mine RV Park in Bisbee, AZ until Monday. On Thursday I will blog about our stay, so far, in this cool little former mining town that sits a mile high in the hills just 5 miles north of the Mexican border. One last grouping of rock formations. It was so hard to pick just a few photos for this blog post!